Concert and congress hall, built as a rebuilding of the previous "Stadtsaal" to new plans. Opened 1950. 1959 extension by the "Kammerspiele" theatre. Opened 1959 with Grillparzer's "Der Traum ein Leben". 1991-1992 renovation and alteration of the "Kammerspiele" theatre. 2010 demolished in favour of the new "Haus der Musik" complex of concert hall, chamber theatre and conservatory. 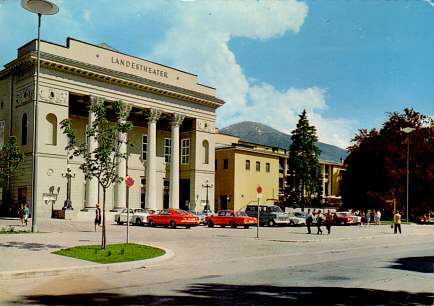 Reverse Text: "Innsbruck, Tiroler Landestheater, Stadtsaal und Stadtcafé"